Honey bees are the best dancers. Waggle dance. 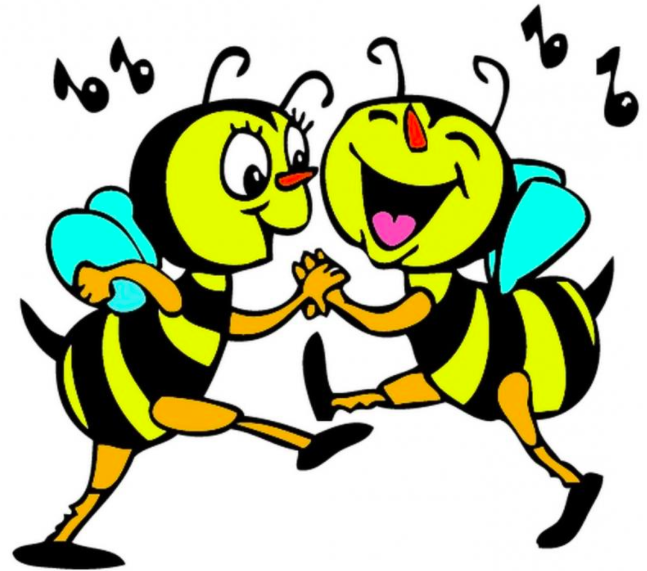 The waggle dance, past history records says that the dance is only meant for women. Many kings of past kingdoms had their own special dancers. They performed on important occasions in the kingdom. This case is also meant for nature. God has given the gift to the beautiful insect, the honey bee – the waggle dancers. The beauty is that only female honeybees can dance. Each and every part of the female honey bee performs a certain dance function. These wonderful dancing activities were discovered by Dr Karl Ritter Von Frisch, who was awarded the Nobel prize in 1973. He named this dance as “WAGGLE DANCE”. This dance is mainly used for communication purpose from one bee to other bees. This dance language is mainly used for two reasons, one is to pass information about the distance of the location of suitable flowers and the other is the direction of suitable flowers. There may be a question that whether one honey bee may mix with another colony or not? No, it can’t mix, because each and every colony has a special odour. They reach their colony based on the odour. Each and every honeybee goes to forage by navigating throughout the day. The success of a honey bee colony depends on the sharing of knowledge with one another. When they find the high quantity and good quality of nectar, pollen in flowers, different honeybees will perform the waggle dance in the honeycomb pointing various directions and share the knowledge which it got about the flowers. Then each honey bee will start to recruit new foragers to the resource. Each honey bee is a differently styled solo dancer.in waggle dance, worker honeybee strides forward while vigorously vibrating her abdomen from side to side. The changing movement of the bees during waggle dance indicates the information about the flower/nectar/pollen. 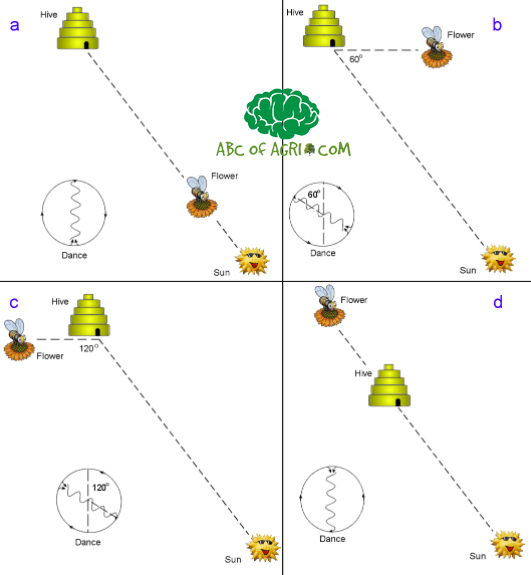 If the bee is aligned straight up the comb during the dance, the dance is indicating a message that the food source is directly in the direction of the sun’s current point where the sun is over the horizon. If the waggle dance is aligned straight down the comb, The dance indicates a patch that the food source is precisely opposite to the sun’s current point where the sun is over the horizon. Dance oriented at ‘3’o clock indicates a patch at 90 degrees to the current point where the sun is over the horizon. These types of indications are mainly to show the direction and the distance of the flowers. Distance is mainly understood by the duration of the waggle dance; shorter time indicates that the target area is nearby and prolonged dance indicates that the target is distant. Even though this type of dance helps to find out the flowers, another component play a vital role in detecting the flowers- that is the odour. The odour of the flower which is also present in the body of honeybee workers. It will also help to locate the flower. Honey bees have 170 odorant receptors. The sense of smell is so precise that it could differentiate the different species of flowers and identify whether the flower contains a pollen or nectar from meters away. A bee fly to thousands of flowers only to make a spoon of honey that is to make 5-7grams of honey. Bees have good knowledge about the earth movements with respective to the sun, and also the bee’s mathematical knowledge helps to communicate the exact location of nearby food to other bees. This dance language is also used for another special kind of work which is mainly to recruit the scout bees. Scout bees act like a father to choose the right place for establishing honey bee colony. These scout bees swarm in a group and find a new nesting site for the honeybees. When they found the new place, the scout bees start to dance in the old honeycomb. The rest of the workers used to touch the dancing honey bees using their antennae and by knowing the scout bees body movement they know the new place and started to swarm to the new colony. Mainly honeybees are the social insects that live in a colony, they have to communicate with each other to be a perfect colony. What we learn from these insects is the “UNITY IS THE STRENGTH” is the perfect example. The only insect that produces food which is mainly consumed by humans to get all substances which needed for the sustaining the life. It contains vitamins, minerals and water and it’s the only food that contains an antioxidant named “PINOCEMBRIN’ which is mainly essential for good brain functioning. The only threat to the other living being is the sting of the honeybee, only female honeybees sting that too when they feel threatened, after stinging it dies. It is also estimated that more than 1000sting of honey bees is enough to kill a human and 500 honeybees sting is enough to kill a child. The average person can tolerate the honeybee sting is 10stings per pound of a body weight. Almost one-third of global farm output depends on animal pollination and it is largely by honey bees. Only honey bees can navigate long distance fields for pollination and the moth and the butterflies lack the ability to navigate long distance. Now the increased use of chemical pesticides had lead to the threat of many beautiful insect life and the big threat has been faced by honeybees. Now we are able to see the honey bees only in the forest areas and soon it will disappear there too and then what about the human life? just think about it. Apian atrophy is a more immediate threat than global warming. Einstein was not always wrong. Our ancient people have given a lot of importance to honeybees. Hindus reference to honey – there is an Indian bee goddess named “Bhramari Devi” the word “Bhramari” meaning “Bees” in Hindi. Lord Krishna has been depicted as a bee.